The best St Patrick's Day I've ever had. We climbed Geumhak Mountain (금학산) in Dongsong, ate kimbab and drank makgeolli at the peak, and wound down with shabu shabu and beer. 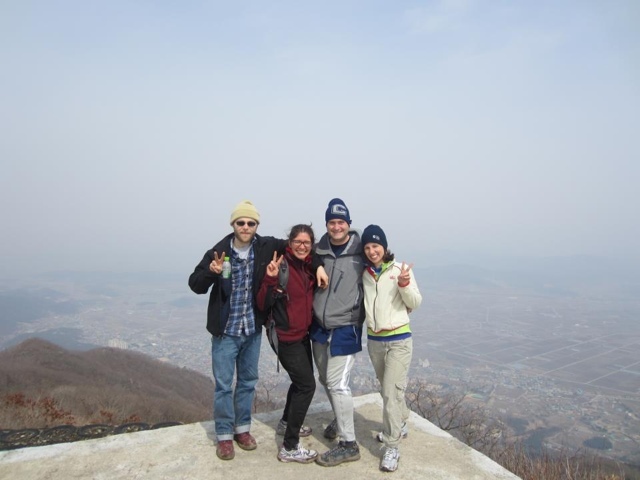 It's possible to see North Korea from the top of the mountain, but we couldn't make out too much in the mountain haze. We happened to go up at the same time a tour group was, so we had some company at the peak. Some of the men and women came by to talk to us because there aren't many foreigners in our area and they wanted to know where we were all from and what we did in Korea. We had a steep and occasionally muddy climb up and down; all of ended up in the muck. The rising spring temperatures warmed up all the snow that lies along the trail to the top and moistened the ground, though we still saw snow in places. What a time. We were all worn out, but exhilarated from the climb. Aside from Dave, the four of us make up the Midwest contingent of the Greater Cheorwon Crew: Wisconsin and Michigan, baby. It's now time to go and get ready for school. Forgetting about St Patrick's Day means one more thing I can talk about at the high school today.